Not every day of our boating trip a few weeks ago was sunny. The day we planned to go up Toba Inlet was more than drizzly. Rain fell in hard splatters on the boat. Visibility was limited. Still, in between gusts of wind and clouds of rain, I managed a few photos. The sides of the fjord rise steeply from the water and fall equally steep below the surface. Mist hung heavy in the valleys, but lifted occasionally to reveal muted greens of forest and sea. We anchored in Brem Bay where the river joins the inlet. Grizzly bears live here and we saw one cross the river. It was a good morning for sipping on hot chocolate while we waited for more bears. They never showed. Perhaps they, too, were hunkering down somewhere in the rain. When the rain stopped for a bit, we took the dinghy and went up river a little ways. The landscape looked almost tropical with hanging mosses and lush ferns. After deciding the bears were not going to cooperate, we headed further up the inlet to see the waterfalls we'd heard about. What is it about water falling over rocks and splashing into the ocean that is so appealing? I took a lot of photos. Tim went back and forth with the boat while I tried out different settings. Most are overexposed. Also, it's kind of hard to take a level photo when the waves lift the boat up and down. In the afternoon we returned to the marina where we spent the night. The sky was clearing and a watery sun peeked through. Smooth, soft water and the promise of a sunny day to come. This week I'm also linking up to Through My Lens, hosted by Mersad Donko. Stunning photographs! What a beautiful trip, and so close to home! Absolutely gorgeous. This area is so beautiful and we are lucky to live here. I just wish we would get more rain this month. Love the calm of the evening photo. Gorgeous views and your photos of them are wonderful! Rain can be really beautiful and in your images it certainly is. Happy Mosaic Monday and have a lovely new week! Absolutely beautiful shots. If you like you can link up with the new edition of "Through My Lens". Link is below. Wow rain or shine you have some fantastic photos. 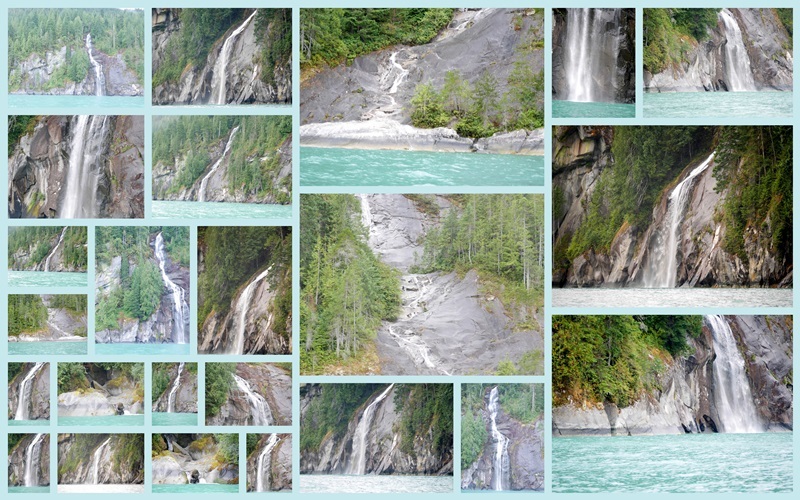 Love the collage of the waterfalls. How beautiful, so calm. Maybe the bears had other things to do?! Do bears have marshmallows with their hot chocolate? The water gently slapping against the side of a boat, I love that sound. I love the stillness of that last shot. I think waterfalls are mesmerizing partly because of the sound of rushing water. So soothing! Beautiful scenery from your boat trip. The mountains surrounding the water is just stunning. I love the sights and sounds of waterfalls. So relaxing! Ahhh...the title of your post describes it aptly, for you did indeed find such beauty in the rain! I wonder if you were disappointed with the weather that morning. I know when we're on vacation, we hope for sunny days. And yet, there was something there that you wouldn't have seen or experienced on a picture perfect day. As always, your artful eye, with your camera playing the supporting role, captured the beauty! Wow Lorrie, you guys must be great navigators to find such beautiful wild places so close to home. The bears, no matter where, always seem to inhabit the areas with the most picturesque scenery - lucky things! It must have been quite nice seeing the scenes in good and not so good weather - you certainly took some lovely photos Lorrie - you could easily have some printed on those cards I just featured in my post! Happy week - without bears! Lorrie, I really like the first pictures where there a gradient of deep green and grays. Water I find restorative to my soul. Thanks for sharing. Sylvia D.
WOW...what stunning and hauntingly beautiful photos, Lorrie! Beautiful photos, Lorrie! The scenery looks so pretty taken from the vantage point of a boat, and the changing weather makes each view look different. Such amazing scenery! Love all the moodiness, too. Now this is just gorgeous surroundings. How fortunate you were to have this adventure even if there were no bears. The water and the green is spectacular. Beautiful photos of your trip! I've read back through your posts and enjoyed the scenery immensely. Loved the bear story, and I can relate with the weak knees!! Glad you were both safe, and the bears were just as worried about you. You are a lucky couple to have these boating trips to enjoy. Gorgeous scenery, spectacular in fact. Loved all your photos from your trip, thanks for sharing them. They have been fun to look at. Gorgeous photos! What a lovely place! Such beauty. The first two photos really captivate me. The beauty is deeply moving. You are so blessed to be able to visit this place. I think I would be in awe the entire time and never ever want to leave. Water and forest are my favorite elements in nature. Tho misty, your photos are fantastic! I like every view and spot. The mist floating bring a different atmosphere to the pictures. Even though you didn't have sunshine and blue skies it still looks gorgeous!! Lorrie, these photos are so beautiful! Such a gorgeous location and with the rain it seems mysterious, too! Misty views are as beautiful as those taken on a sunny day because then you get a mysterious feeling to the photo and they are all fabulous Lorrie. You are lucky to live in your province of diverse landscapes, thank you for sharing at Mosaic Monday. These photographs filled my heart with their beauty. Interesting photographs. We have been having so much torrential tropical type rain and for days at a time. Our Summer seemed to end with the July heatwave! Glad you were still able to enjoy the boat trip. The scenery is breath-taking, so beautiful especially in the low clouds and misty shroud. Just beautiful. I'd like to see a bear, too--at a distance. I always like to see misty shots and yours are very nice. The waterfall photos are awesome!